Exercising is a great and worthwhile way to spend your time, but what good is getting in better shape if you’re only going to injure yourself? Nothing is worse than feeling incredibly motivated to crush your workout, only to find that you’ve hurt yourself and you can’t fully exercise for a matter of weeks, months or even longer. This is precisely what your Brandon personal trainer experts here at ABS Fitness would like you to avoid. Fortunately, there’s an incredible amount of information and science out there about exercise, and consequently, ways to exercise safely and prevent injury. 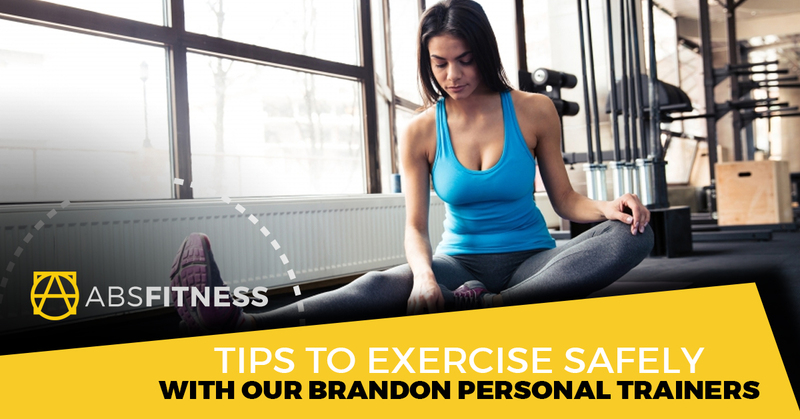 Our gym in Brandon would like to cover some of these exercise safety tips in today’s blog post so that our readers are a little more well-informed about how to workout safely. If you’re looking for a small space home gym and the individualized, one-on-one personal training that you deserve with a gym membership, look no further than our own fitness gym here at ABS Fitness! Learn more about our training programs today. Don’t jump right into things with a resting heart rate. Your heart rate should progressively increase as you warm up, and you should also get a good stretch in before you begin cardio, strength training, lifting, core exercises, and so forth. Dynamic stretching is a great way to get your muscle groups warmed up that you’re going to use during the workout itself. If you’re feeling sick, overly fatigued or lightheaded, stop working out! If you feel like you don’t have the energy to finish an exercise session, gritting your teeth and pushing through the pain isn’t recommended. Suffering persistent aches and pains in your joints after each workout is also a sign that your body needs some rest. Pay attention to the way your mind and body feel going into a workout, during the workout, and afterward during the recovery period. Runners often complain about “side stitches” during long runs, in which major cramps flare up and cause them to stop the run. A major reason for some of these flare-ups is because they’re significantly dehydrated. We’re not saying that you should drink a gallon of water right before your workout with our personal training services, but coming in well-hydrated is only going to help you perform well. Plus, not only do our bodies have more energy when we drink enough water, but our minds are sharper, too. Exercise definitely has a mental component to it! We greatly respect our clients’ motivation to get healthy and improve their shape, but don’t work yourself out to exhaustion. It’s not going to do you any favors. If you stop exercising for awhile, scale back to a lower level of exercise initially, and then build up from there. Our one-to-one gym is a no-pressure, no judgment gym that allows our clients to experience the comfort and support that they deserve during a workout. Come visit our personal training gym in Brandon today!